Many general aviation-type aircraft are equipped with ADF radio receiving equipment. To navigate using the ADF, the pilot tunes the receiving equipment to a ground station known as a nondirectional radio beacon (NDB). The NDB stations normally operate in a low or medium frequency band of 200 to 415 kHz. The frequencies are readily available on aeronautical charts or in the Chart Supplement U.S.
All radio beacons, except compass locators, transmit a continuous three-letter identification in code, except during voice transmissions. A compass locator, which is associated with an instrument landing system, transmits a two-letter identification. NDBs have one advantage over the VOR in that low or medium frequencies are not affected by line-of-sight. The signals follow the curvature of the Earth; therefore, if the aircraft is within the range of the station, the signals can be received regardless of altitude. One of the disadvantages that should be considered when using low frequency (LF) for navigation is that LF signals are very susceptible to electrical disturbances, such as lightning. These disturbances create excessive static, needle deviations, and signal fades. There may be interference from distant stations. Pilots should know the conditions under which these disturbances can occur so they can be more alert to possible interference when using the ADF. The navigational display consists of a dial upon which the azimuth is printed and a needle which rotates around the dial and points to the station to which the receiver is tuned. Figure 16-37. 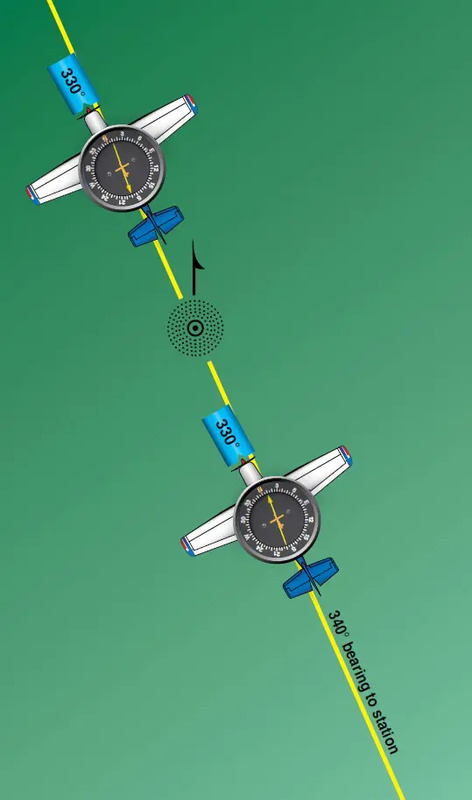 ADF with fixed azimuth and magnetic compass. Figure 16-38 illustrates terms that are used with the ADF and should be understood by the pilot. Keep in mind that the needle of fixed azimuth points to the station in relation to the nose of the aircraft. If the needle is deflected 30° to the left for a relative bearing of 330°, this means that the station is located 30° left. If the aircraft is turned left 30°, the needle moves to the right 30° and indicates a relative bearing of 0° meaning that the aircraft is pointing toward the station. 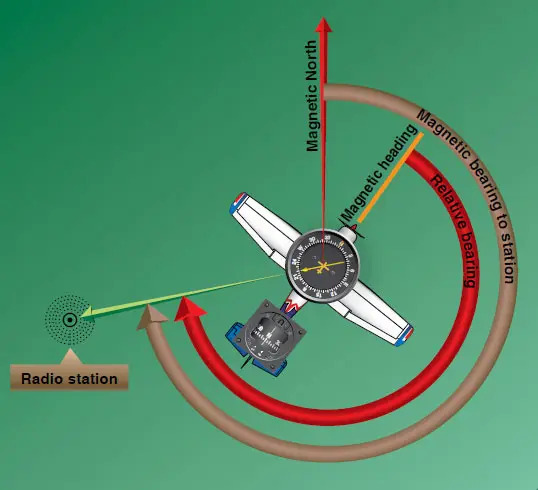 If the pilot continues flight toward the station keeping the needle on 0°, the procedure is called homing to the station. If a crosswind exists, the ADF needle continues to drift away from zero. To keep the needle on zero, the aircraft must be turned slightly resulting in a curved flight path to the station. Homing to the station is a common procedure but may result in drifting downwind, thus lengthening the distance to the station. 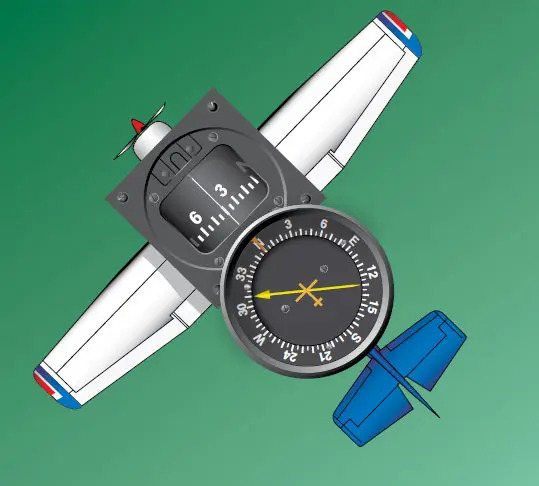 When tracking away from the station, wind corrections are made similar to tracking to the station, but the ADF needle points toward the tail of the aircraft or the 180° position on the azimuth dial. Attempting to keep the ADF needle on the 180° position during winds results in the aircraft flying a curved flight leading further and further from the desired track. When tracking outbound, corrections for wind should be made in the direction opposite of that in which the needle is pointing.